Irell & Manella LLP partner Jane Shay Wald was installed as President of the Century City Bar Association (CCBA) on March 1, 2011. Ms. Wald has served on the CCBA Board of Directors since 2006 and previously held positions as President-Elect, Vice-President, Secretary and Treasurer. Ms. Wald is chair of the firm’s trademark practice group. Her practice focuses on trademark, unfair competition, false advertising and copyright. Ms. Wald counsels clients on acquiring and maintaining U.S. and foreign rights and on potential and pending infringement problems. She also counsels regarding titles, names, logos, and configurations, and prosecutes trademark applications in the U.S. Patent and Trademark Office. In addition, Ms. Wald litigates before the Trademark Trial and Appeal Board and the federal courts and counsels regarding IP issues, especially trademarks and trademark licenses, in distressed assets contexts. The Los Angeles and San Francisco Daily Journal named Ms. Wald to its 2010 list of the "Top 100 Women Litigators" in California, recognizing her for being a "leader in trademark infringement suits in federal court and before the U.S. Patent and Trademark Office." Ms. Wald has also been selected a "Best Lawyer" for 2007-2011, and has been named to the list of Southern California "Super Lawyers" for her work in intellectual property for 2005-2011. With more than 4,000 lawyers in Century City, the CCBA’s mission is to provide top-quality legal programming, enhance and promote the sense of community among Century City lawyers, honor Century City attorneys who have achieved extraordinary accomplishments, and provide leadership opportunities to lawyers who participate in the CCBA. 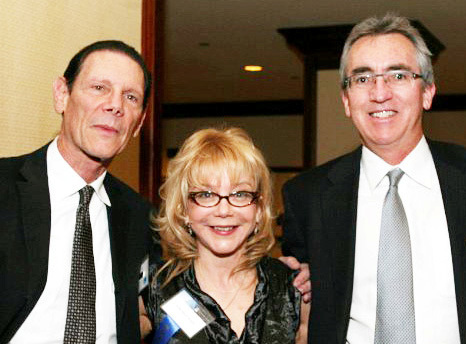 Jane Shay Wald celebrated her installation as President of the Century City Bar Association with guests Dr. Charles Kreuter (left) and Brian Currey, General Counsel to Mayor Antonio Villaraigosa, at the CCBA’s 43rd Annual Installation Banquet and Awards Ceremony held at the Hyatt Regency Century Plaza on March 1, 2011.